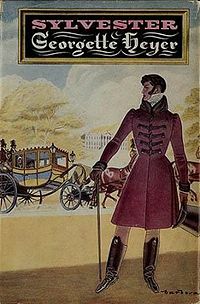 I always include Georgette Heyer near the top of my list of favorite authors, but over the past several years, I've not read a book by her that I've truly loved. I had this idea that I should read all of her books at least once before re-reading any of them. And so over the past several years, whenever I've felt unmotivated to read or have stared at my shelves and not wanted to take down anything, I've turned to Georgette Heyer and one of her mysteries. And while they've generally entertained me, they have none of them held me in thrall the way that I expected. Recently, I went three full weeks without finishing a book and could not figure out what the problem was. So I went again to Georgette Heyer, but this time I found myself reaching for one that I knew I would enjoy. I don't know when I read Sylvester for the first time. My Heyer love affair began well over a decade ago, so it's probably been at least 8 years since I've read this one. I remember it so vividly, though, even though I don't remember it being one of my favorites. The book is basically a retelling of Pride & Prejudice - the hero, Sylvester, is quite arrogant and the heroine, Phoebe, takes him in dislike even before she knows him. And then she writes a book in which he figures as the villain (the wicked uncle alluded to in the alternate title) and then she realizes that he's not quite so horrible, and everything becomes a big, hilarious mess, as they are wont to do in a Georgette Heyer romance. This book reminded me of why I love Heyer so much. It is completely full of Regency slang, full of fashionable men, intelligent women, and lots of situational comedy. Yes, there's Heyer's usual classist snobbery, but it's so much fun. I think what I appreciated much more about Sylvester this go-round was just what a great friendship Sylvester and Phoebe formed. Sylvester is so self-assured and confident, but he is also very protective of himself and his feelings. Phoebe gets very nervous when people are unkind, but she is also someone that people instinctively trust and is completely open in everything she does and says. It was wonderful to see the effect the two of them had on each other - Phoebe called Sylvester out every time he was selfish or ignored the needs of other people. And Sylvester really did try to change when he realized how insufferable he was. He looked at himself and realized that he needed to change. Similarly, he helped Phoebe gain confidence in herself and to understand that being different is not always a bad thing. Their friendship matures quite naturally, and so it's a horrible moment for everyone when Phoebe's book is published and Sylvester sees the way that she portrayed him in it. There is so much raw emotion and the biting remarks and arguments are very believable. And of course, all of this happens with the help of an all-star ensemble cast of characters who are written with the sly wit that puts Heyer so high on my list of favorite authors. I don't think Sylvester is one of Heyer's best books, plot-wise. There are points introduced early on that are ignored for the rest of the novel until being hurriedly reintroduced at the end. But I do think the book is populated by some of her most human creations. Sylvester and Phoebe are both flawed individuals, but they are so good for each other, each making the other a better and stronger person. And that's the best kind of romance. And it makes for an excellent re-read. I channeled your love for Heyer, and bought about 4 of her books, but I am not sure this is one that I got. It does sound deliciously fun though, and I love that the characters are so human and so realistic. I have just gotten my toe into the Sarah Tolerance mystery, so there is not time for this one right now, but you'd better believe that this one is going at the top of my list. Your stellar review has captured me!! Good job today with this one. A reread that stands out like this is destined for my doorstep! I really should read Georgette Heyer. I have tried her in the past and we just didn't click. I should try again! Aw, I didn't buy this one when I went on my last Heyer binge, and now I wish I had! It sounds deliciously fun. Rereading is great, isn't it? I don't do it enough. I've only read one Heyer, after reading your review this one will be my next. I'm glad you enjoyed your re-read. I've only read four Heyer novels so far and with so many still to read it's difficult to choose which one to try next! I'll have to keep this one in mind. This is making me equal parts want to reread Pride and Prejudice and read Sylvester (which I think I own, somewhere) for the first time. Georgette Heyer is a lot of fun. This is never a comfortable book for me, I think I take Phoebe's trials too much to heart, starting with her stepmother - and culminating in that moment when Sylvester walks away from her, so devastating. But I agree, it has a wonderful ensemble, who add so much to the story. I've just finished The Unknown Ajax, which was very funny (and I hadn't read before) and am now re-reading one of my favourites, Frederica. I knew when I started Ajax that this would lead to a mini-binge, but sometimes a good GH just hits the spot. I agree that her Regency romances are her best: they remind me of classic screwball comedies! Can't you just see Cary Grant playing a lot the leading men? My most recent Heyer was Cousin Kate, which is more gothic than most of hers. It was an interesting contrast but my favourites are still the funny ones. I think I've decided that I shall love Heyer vicariously, so I quite enjoy your posts about her, but I think I'll continue to enjoy them more if I leave my experience of her at that. Well, that's something of a compliment anyway (to you), or at least I mean it to be. Hee. Heyer is an author that has been on my list for quite some time but I have yet to read. Sounds like I really should move her up the list.